 An uneven but often delightful tribute to the world of predialogue films. Pioneer film collector Card, founder of the Eastman film archive and the Telluride and Montreal film festivals, may be the leading authority on his subject. 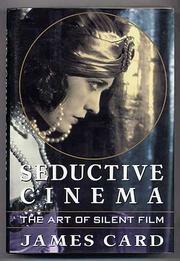 This revisionist history of silent film, though erratic, is studded with moments of insight and critical understanding. Card calls attention to hundreds of important silents, many overlooked--in part due to the Museum of Modern Art's hegemony over the legacy of early American film. Card has rescued thousands of rare works from oblivion and worked to bring attention to those who produced them. Here he sheds light on the work of directors John Collins, Monta Bell, and Marshall Niehlan; debunks critical overestimation of the contributions of Edison, Eastman, Von Stroheim, and Griffith; and demands reappraisal of neglected work by Cecil B. DeMille and others. His take on the issues is striking: how critics can miss the boat when they see films just once; the undetected influences of filmmakers on one another, such as that of King Vidor on Italian neo-realists; how overemphasis on cinema's auteurs leaves many contributors to great films unappreciated; and how discoveries of early cinematic wonders from Japan, Russia, and elsewhere compel revision of film history. From such acute concerns Card sails into long chapters detailing the careers of favorite stars; here far less critical rigor prevails. He reserves a chapter for an out-of-hand dismissal of semiotics, never really locking horns with the subject. Still, the book's best moments demand reckoning with, and Card's is the beckoning tone of the true addict; his history makes us itch with desire to see the films he describes. Despite its uneven qualities, Seductive Cinema will prove a field day for aficionados and an education for those who remain unaware of early cinema's glories.